Perhaps the fascination with the “romance” of rural life came from recognition of the strong ties people had to the land and to each other. Theirs was a “social economy” linking one neighbor to the next rather than today’s monetary-based consumer economy in which we seem more linked to our possessions than anything else. 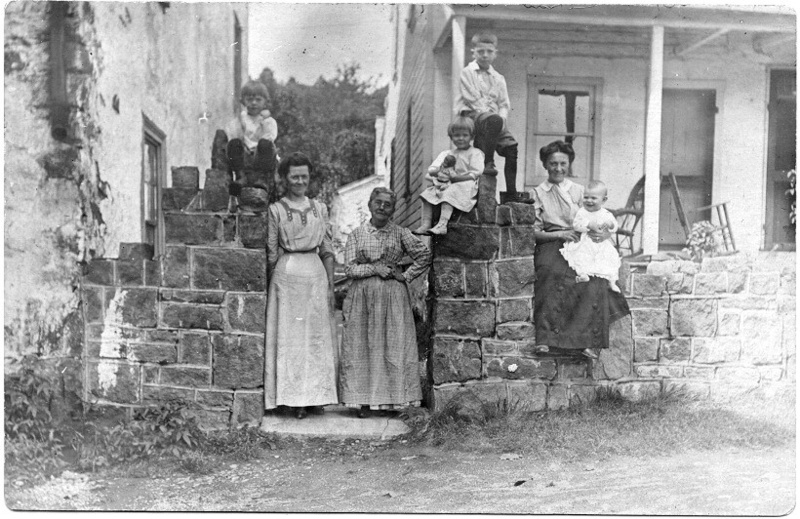 The hard work of agrarian life defined the rhythms and patterns of life in a small town and those interdependent relationships were vital to the town’s basic survival. Without the saddler, the blacksmith, the shopkeeper, or the miller, life would not have been possible. Today we often sentimentalize this picture of “community.” The reality, rather than the romance, showed that daily life was challenging. 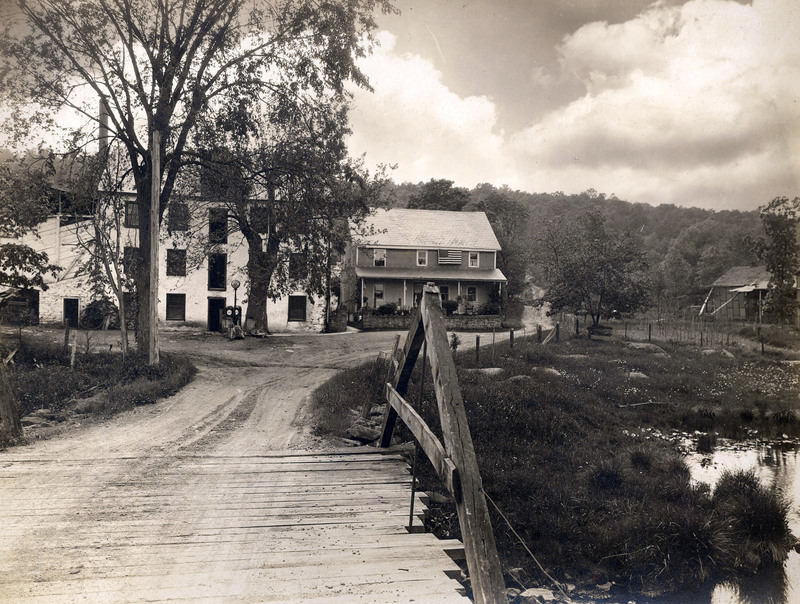 White’s Mill was notable as the last mill in Montgomery County to run on water power. [i] A business card from the later period of White’s Mill’s existence shows that in addition to the “flour, feed, grain, seeds, crushed stone, ice,” and sawmill output, Thomas White added goldfish and aquarium plants to the list of businesses he pursued trying to make ends meet. Journals and accounting books pay careful attention to every penny spent, orders delivered, services required. Found among Paul White’s papers after his death in 2002 was an envelope marked “Careful: Notes from my Father to my Mother.” Inside the envelope were three letters, all variations on a theme, meant for Anna White in the event of a fatal accident. One in particular is so worn it is nearly falling apart, especially along the crease lines. The pencil writing is nearly rubbed away with wear. Holding the ragged scrap in hand, one wonders if he kept this particular paper on his person each day, knowing it would be found immediately if something were to happen to him. 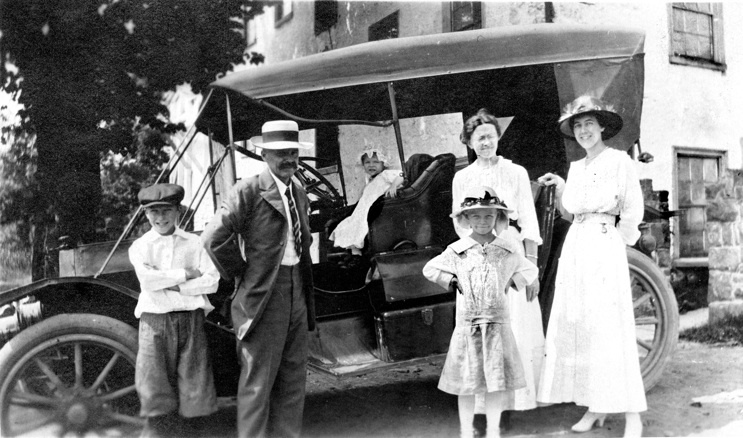 White Family of Tylersport, PA, from l to r, Paul White (my grandfather), Thomas White, Esther (in driver's seat), Anna Mergner White and daughter Ruth, and Anna's cousin, Violet Belz. The mill building is behind them. The written words bring him to life in a way nothing else could and offer a heartbreaking glimpse into the White family’s life and times. This is deepest heartfelt emotion; words from a man looking at his own demise and wanting to protect his family from beyond the grave. Although the letters date from between 1900 and 1935, the year he died quickly and unexpectedly from a heart attack just days after his 64th birthday, the feelings expressed are timeless. Here is the first, and apparently earliest, of the letters. Am starting this wondering if it will ever reach your eyes, and if so, will it help you any. I hope so. Years & years & years I have hoped to get free of this place to an advantage, but so far those hopes have not been realized and the hope grows less at times, then again is revived. Surely has me blue and discouraged trying to keep ahead of the bills. If you do see this I will not be here to help. And you will have to decide on what you want to do. As you know, you will have the direction of things, and if the following advice is any good this writing will be justified and I am glad. Would suggest you arrange some of it to be paid monthly over a period of years. But please first thing possible send check for all bills in the drawer not paid. The easy way, I suppose, would be to make sale, but you understand you do not need to sell anything you do not want to, all is yours to do with as you please and can. I suppose: ‘even as I have had hopes for a home elsewhere in the future,’ you have had the same, I trust the where-with for that same may be realized when you clean up. I will not make an estimate of what it might be, the insurance alone will make a goodly sum. Perhaps you might be justified in retaining the place for the kids, if they feel so about it, but I assure you, the cost of keeping it in repair, taxes, etc. will be considerable. Sometimes I feel how I would like to fix it up (this place) but the money did not come my way to blow in. Hurrah for the Whites. And God bless you all. December 10 Tw­ – [Thomas White’s 64th birthday] Clear. Load feed from [illegible] and oats from Stover. December 11 W – Cloudy not so cold. Anna, Esther and myself at Sears, Phila. December 16 M – Cloudy and some rain. A few jobs of insignificant [?] nature. December 19 Th – Not so cold. Bank. Put 4 loads of firewood in cellar. December 20 F – Cold and windy. Jim brot [sic] last of cob corn from Sellersville orders. Tom passed away about 1:30 a.m. quite suddenly sick about one and a half hours. 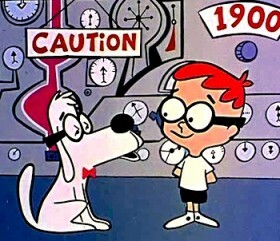 Dr. Nace came in only a short time after I called him, and stayed with Esther and I until almost three o’ clock. Esther sent for Jim, we could not get any one via telephone from Jeffersonville, so Jim went down, and Lydia came with him, stayed with us until Tuesday, day of funeral. We layed Tom away today. We miss him so, but The Lord knows what is best for us. I feel that Tom is now at rest, will try my best not to worry. Am more than thankful to have Paul and Ruth with me, they are such a comfort and help to Esther and I. The journal also has a list, in Anna White’s neat handwriting, of the family and friends who sent flowers, and next to their names she detailed the type of arrangement and flowers used. One imagines her writing thank you notes after the funeral, as she wondered what she would do after the loss of her husband. Public Sale of Personal Property! There will be sold at Public Sale on Saturday, April 18th, 1936 at the late residence of Thomas H. White, deceased About One and One-Half Miles North West of TYLERSPORT, known as WHITE’S MILL the following personal property, to wit: 25 chickens, 10 tons hay, 200 bundles cornfodder, Ford runabout, hay wagon, two-horse wagon and body, 2 good mowing machines, grain drill, reaper, one-horse cart, 2 hay rakes, land roller, springtooth harrow, 2 bob sleds, 2 blowers, hay ladders, double ladder, 2 plows, manure carrier, two brooder stoves, chick feeders, coops, 12 new water pumps, safe, desk, lot of harness, 2 bag trucks, 50 gal. roof paint, oil tanks, lot of good forks, rakes, shovels, stone hammers, crowbars, drills, hammer mill, pipe wrenches, thread cutter, all kinds of wire, belting, lot of boards, scantling, chain hoist, lot of bags, etc. Household Goods: Bureaus, 3 washstands, library table, bedstead, chiffonier, davenport, 2 extension tables, hall racks, lot of chairs, electric washer, waterless cooker, bread mixer, 3 rockers, 3 9×12 rugs, two Brussels and one Axminster, Eureka range, nearly new, parlor stove, lot of china and glassware, all kinds of cooking utensils, jars, etc. etc. Sale commences at 12 o’clock noon, Conditions by Anna E. White, Executrix of Thomas H. White Estate., Raymond Hendricks, Auctioneer, Harvey J. Stoudt, Clerk. Tylersport remains relatively rural to this day, saved from overdevelopment by its distance from Philadelphia, its isolation from highly traveled roads and rails, and its distinctive geology and topography, although it is certainly changed from the time when the mill wheel turned. 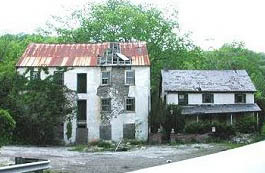 Without a purpose to earn its keep, White’s Mill was torn down in 2002 in favor of “open space.” Surrounded by forested preserves, the township supervisors concluded that razing the building and clearing the land had more value than a historic site representing the milling heritage and the community history of the area. The sole remaining building is the original residence, unoccupied and subject to vandalism. Bullet holes let light into the attic. An author writing in 1933, two years before Thomas White’s death silenced White’s Mill forever, bemoaned the passing of the old ways. The passage below serves as a eulogy to the hundreds of the old mills of our countryside that have vanished from the landscape without a trace. [iii] Jim White recalls the rocker was placed in the living room of Anna White’s Stenton Avenue home. Following her death, daughter Esther kept it, and it passed on to her niece, Bertha. What a marvelous bit of time traveling, Sabra—a peek at the daily life of a miller and, in his letters, a touching reminder of how tough and fragile the life was. Your family is so fortunate that you were able to piece together all these details. It’s sad that the mill ended up just being torn down. It seems to me it had the potential to be an exhibit or museum. I can see you’ve done a lot of great research. I’m glad I ran across your blog! By the way, just curious, how do you track down these places you research? Could have been fantastic community space, art studios (huzzah for the creative economy! ), or even loft apartment space. Different kinds of people need and desire different kinds of living spaces. Not everyone who lives in the ‘burbs wants to be in a house or 1980s vintage townhouse. The miller’s house supposedly dates to the 18th century (the house we see now was built around the original structure — old, old bones). This site I wrote about for obvious reasons — the family connection and plethora of materials available to me (many of which I haven’t even featured yet…) Genealogy is often a leaping-off point, as was classwork for my masters degree. Thanks for visiting, Matt! Thank you for writing an excellent story portaying the history of the old mill. I grew up right up the road from there and saw the decline of the condition of the buildings. It is a shame they have been torn down never to be seen or experienced by our children except for the few rare photographs that remain. So sad that the modern ways have taken over and the historic landmarks slowly slip away into history. 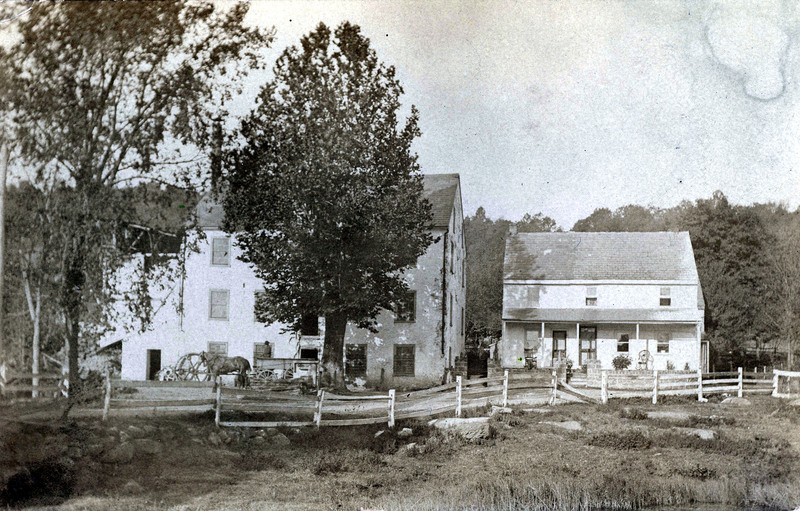 The old mill buildings would have made an excellent museum or historic space for Salford Township.